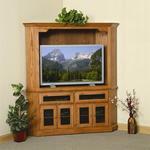 This stunning glass-fronted corner entertainment center packs as many features as possible into every inch of its solid wood frame. The Shaker Corner's look is defined by the beautifully cut edges and strong, traditional lines that allow it to look completely at home in a room's corner, while its various size options ensure that it'll fit your particular corner easily. By using height and innovation, its design enables it to offer all of the functionality of a much larger entertainment center in a fraction of the space. Additionally, every element of this piece is crafted by hand from solid wood right here in the USA, bringing you nothing but the best in American quality and workmanship. All of the Shaker Corner's surfaces are hand-finished, giving them an unbelievably smooth, glossy feel that you just can't get from machined tops. Add further features to your unique Shaker Corner using the menus above. If you've any questions at all, or would like to discuss working with our woodshops to create a completely custom piece, please don't hesitate to get in touch with us by phone or by email. We would love to help you bring your vision to life in every last detail. 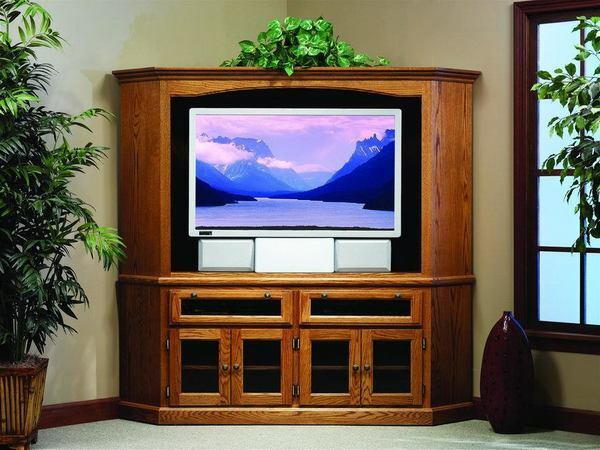 Inside Height for TV: 35"
Inside Middle Depth for TV: 15 3/4"
Inside Side Depth for TV: 12 1/4"
Inside Width for VCR Area: 21 5/8"
Inside Height for VCR Area: 6 1/4"
Inside Width for Bottom Cabinet Area: 21 5/8"
Inside Height for Bottom Cabinet Area: 14 3/4"
Inside Width for VCR Area: 24 1/8"
Inside Width for Bottom Cabinet Area: 24 1/8"
Inside Width for VCR Area: 26 5/8"
Inside Width for Bottom Cabinet Area: 26 5/8"